It’s my pleasure to welcome Heather Garside to my website. Heather is the author of Breakaway Creek and a delightful rural romance writer. She’s answered a few questions I though you might be interested in having a look at. She has previously published three historical romances and has helped to write and produce several compilations of short stories and local histories. The Cornstalk was a finalist in the 2008 Booksellers’ Best Award, Long Historical category, for romance books published in the USA. Breakaway Creek was a finalist in the QWC/Hachette Manuscript Development Program and is her latest release. Holly Colter leaves her career in nursing to help her grandparents on their Queensland cattle property. But she hadn’t bargained on Jesse Kavanagh, the boy who broke her heart and ended up in trouble with the law, being back next door. While doing her best to avoid Jesse, she indulges her love of history by trying to uncover the truth about a murdered ancestor. Mercy Forbes is shocked but hardly grief-stricken when she finds her abusive husband murdered. Sergeant Jake Morrison is determined to find the killer, despite his suspicions about Mercy and a growing attraction between them that threatens to undermine the case and his policing career. Thanks so much, Heather! You can see the interview I did at her website here. 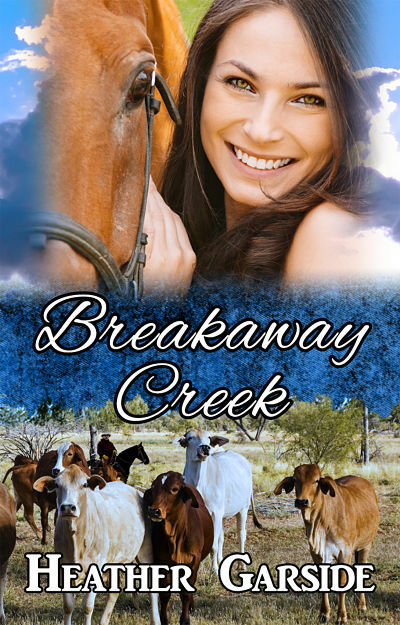 This entry was posted in Uncategorized and tagged Breakaway Creek, Heather Garside, interview, romance author, romance book, rural romance. Bookmark the permalink. Thanks for having me on your site, Jane!